There are some stamp issues where the rarest thing is a well-centred, well-printed stamp. At the other extreme, there are stamps like Russia's Imperial Arms definitives where printing was strictly controlled and varieties, even quite minor ones, are seldom seen. The pictorials lithographed in Baku in 1919 - 1921 were carefully printed, even though this must have been quite difficult to achieve - the printing sheet was large newspaper, thin and difficult to handle. The "Beach at Baku" variety shown above is created by a downward shift of the blue colour of the sky and sea. It is rarely seen as marked as that in the top block of 12, though a little more often with a less striking shift like that in the second block of 12. 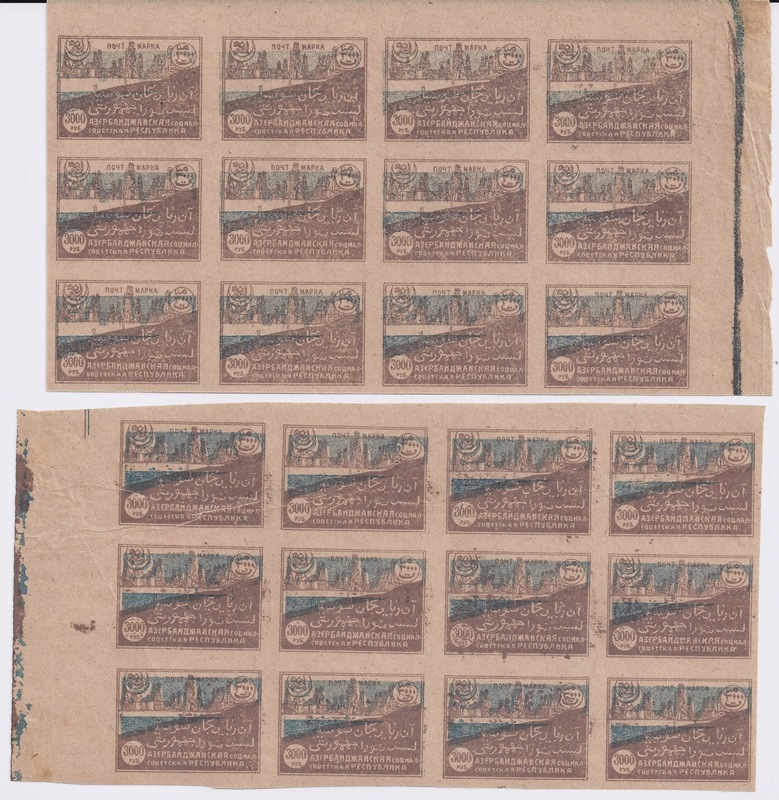 Remainders of the Azerbaijan pictorials were sold of from Moscow in sheets and some of these came to England and into the 1950s collections of philatelists like Ian Baillie and Peter Ashford, usually cut up to fit album pages. I don't know which other countries picked up quantities of these remainders.